Pole position? Or running behind the times? The adverts position Santander as one of the Formula One brands. Here are some thoughts on why I don’t think they really work in favour of this brand. The images come across as contrived and – apologies to the designers – a bit messy. The main graphics features racing driver Lewis Hamilton wrapped in a range of brands – Mercedes Benz, Vodaphone, Boss etc – some in a far more prominent position on the driver’s suit than Santander. It does (in my mind at least) not convey the message of being ‘In Control’ especially since the advertiser’s logo is cluttered by other brand icons. Visually, the first thing I saw was the Mercedes Benz star, then I noticed the Vodaphone logo and finally I did make the effort to follow the ad to the Santander logo. There seem to be at least three strap lines there as well – ‘In business with you’, ‘Driven to do better.’ and ‘Value from ideas’. All have their own different typography. To add to the disjointed image they put on a QR code and yet another logo linking to Santander. The messages don’t gel and they don’t make me want to scan that QR code and find out more. They just create a sense of ‘design by committee’ where too much was packed in. 3) The right brand ambassador? I am no Formula One expert by any means but it seems to me that Lewis Hamilton has been more in the press recently for his on/off relationship with Nicole Scherzinger than winning races. And even if he is ‘consistently improving this season’, as a brand I would be very careful in the selection of a person that you associate your brand’s persona with. A step too far for Iceland brand values. 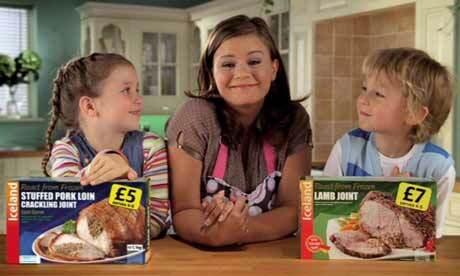 Following photographs of Katona taking drugs, she is dropped from the advertising campaign of the supermarket chain. Iceland is a great example for how not to pick women as responsible brand ambassadors – Kerry Katona and Stacey Salomon, both displaying dubious behaviour. Katona was dropped quickly following her drug revelations and Salomon was stripped of her ‘mother of year title’ when she was ‘caught’ smoking whilst pregnant. “Stacey has proved to be very popular with our customers over the last 18 months. We understand she deeply regrets the embarrassment she has caused with her recent actions but we are also aware that she has significantly reduced the number of cigarettes she smokes. Some other less fortunate brand partnerships included Garry Glitter and National Rail and Kate Moss and Burberry who dropped her following her drug scandal. Going back to the Santander advert, in light of all the issues with banking, even if Hamilton was still winning every race, I am not sure it is the best message to invest money and effort in being associated with Formula One at this time of financial difficulty. Whilst other banks drum home their messages about security and responsibility, ‘In Control’ and ‘Pole Position’ seem to be missing their point a bit… Let’s hope they can recover their brand message as well as their credit rating. It may take more than showing a race driver to regain the trust of businesses in the UK.